If you’re like me – and I know many of you are – you don’t really have a straightforward answer to the question “What do you do?” Sometimes I wish I could straightforwardly say “I’m a teacher” or “I’m a doctor”, but of course I’m very glad to be self-employed, and over the years I’ve figured out how to explain myself and avoid too many puzzled looks. In the small business world an elevator pitch was originally the concept of having to pitch an idea to someone while you had the good fortune to ride in a lift with them – quickly and succinctly. Over time we’ve grown to use it to refer to lots of concepts and small business owners are often taught to craft an elevator pitch to describe their business clearly in the hope of gaining work. The problem with the elevator pitch idea is that I’ve seen lots of clients come to me with a beautifully perfected paragraph they can rattle off to explain their work, but it’s often become completely unconversational and too detailed. Whether someone asks you “What do you do?” or you’re in the situation where you need to introduce yourself and your work to somebody new, it is important to have thought ahead of time about how best to answer this. You know they always say that first impressions count, and you might only get one chance to explain yourself to this person who might end up being your ideal client! practice! It’s unnatural and weird to practice this but I know I’ve only got better at this over the years with practice! Being a blogger, a podcaster and a social media consultant, I have met many, many people in my life who have very little idea of what I do. That means I’ve had to really think about how I can explain it, and that I try to phrase things very differently depending on the audience. I work for myself – I have a blogging and social media business. Their response to this tells me what else I should say – they might know something about it, know nothing, work in marketing, who knows – but that short sentence is enough to open up the conversation and it can go in any direction from there. I run a blogging and social media consultancy – mostly I help small and solo businesses to promote themselves online. At some stage, I usually add, “I also run a travel blog and podcast – it’s heaps of fun!” But the key point here is that my answers are short and fairly general, and I let the audience really determine what else I’ll say. 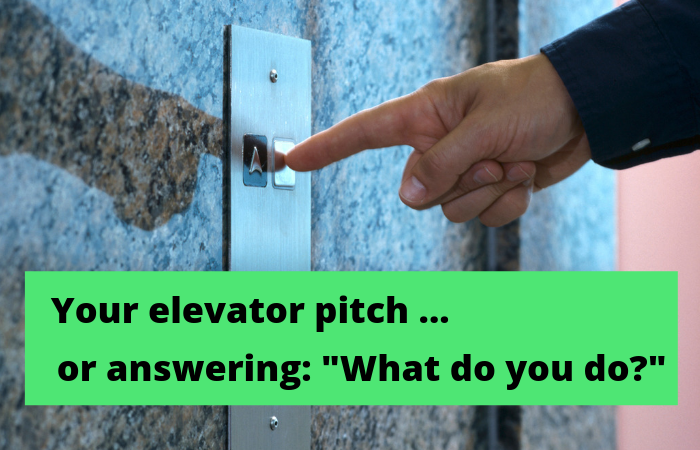 So with all that in mind … what’s your elevator pitch, or probably better expressed, how do you answer the “What do you do?” question? Let me know in the comments or message me if you want some advice on how to phrase it!